Cyprus is an island in the Mediterranean Sea in south-eastern Europe. It is the largest island in the Mediterranean. 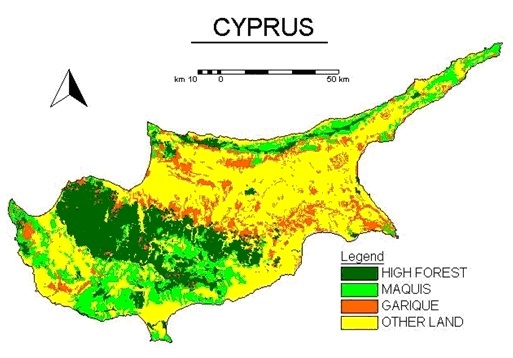 Cyprus has an extreme Mediterranean climate. It has a hot, long, dry summer and a changeable warm winter. The mean annual temperature is 17.8° C and the relative humidity is 60 %. The mean annual rainfall is about 500 mm. (CMS 1995).